As the days are about to start getting longer again, it’s a great time to reflect on 2016. While at the same time hatching our plans for a fabulous 2017. Richie and I are now in our fourth year, since we created Vintage VW Campers and every year gets better and better. Thanks to all of you who have participated or shared in our journey along the way. In 2016 we welcomed more self-drive holiday guests than ever, chauffeured more brides and grooms than before and somehow, we seem to have ended up with an end of year count of nine Volkswagens and a Teardrop Trailer to look after! Blondie & The Nodpod featured in a major German network TV show: “Once Camping, Always Camping.” Which was shot in 2015 and aired in June this year. Robin McKelvie, one of Scotland’s foremost travel writers took his family on an adventure with our own Ziggy Starvan in The Scottish Borders. He was then kind enough to share his experiences through his writing on Welcome to Scotland and The Daily Record. Our Small Business Saturday Open Day was a great success, lots of fun and we even managed to raise over £150 for Strathcarron Hospice at the same time. Our Guest Best Photo Competition 2016 has been won by Matt Hay but there really were (as always) some great contenders. 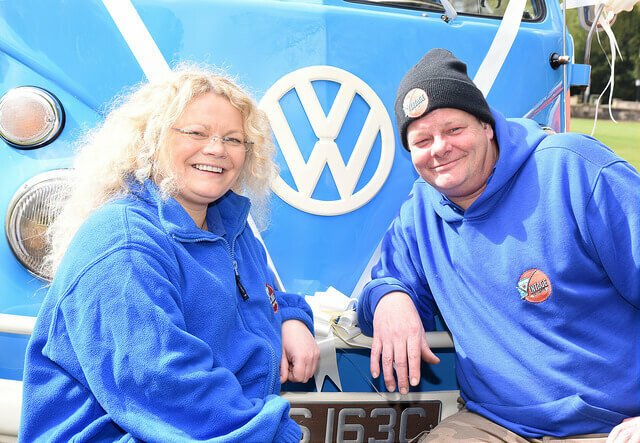 I’m happy to report that in 2016 we had nothing returned to Vintage VW Campers HQ on a tow-truck and all the extremely hard work that our mechanic, Davie at Solway Campers put in was well worth the time, money and effort. Richie and Davie are currently expending the same effort, with our winter restoration programme, ensuring 2017 goes just as well. Meanwhile I’m working on lots of exciting website content updates and the complicated, techy stuff is in the capable hands of Carl at Karbon Designed. Business Gateway and their Digital Boost training and consultancy has been a great support for me also. If happiness really is a state of mind we can control, then it’s important to set and preferably write down our goals for 2017. Some of my strongest desires don’t change year on year. In 2017 I’d like to have 100% guest satisfaction. 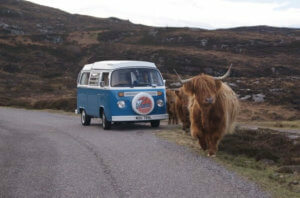 I’d also like to share our beautiful campervans and country with even more customers than before. Although the domestic market is our strongest, followed by Europe, North America and Australasia, we were delighted to welcome guests from Thailand and Singapore for the first time this year. I wonder what new nationalities we will meet in 2017; wherever you are in the world please visit Scotland and if you fancy seeing the scenery from the slow lane, please check out our family of classic campers. I really need to get to the post office now, as I have more of our VW Campervan Gift Experience Vouchers to post. If you or your loved ones are planning a self-catering holiday in Scotland in 2017, then our vouchers could possibly be the best Christmas gift ever. There’s still time to get your order in by calling 0131 344 4146 or emailing [email protected]. 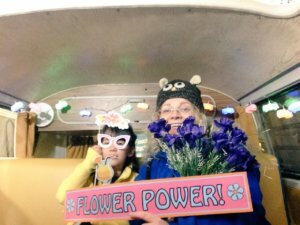 Brides & Grooms, or anyone celebrating life’s milestones can also use our gift vouchers towards chauffeur driven experiences in our 1965 VW splitscreen microbus, Meg. Volkswagen campervan hire in Scotland really is a unique adventure of a lifetime. Where will your 2017 journey take you?